We all know that chemical pesticides and herbicides kill bugs and weeds that can prevent our food from growing. But would you go into your kitchen, pull out some RAID from under the sink, spray it on your carrots or green beans, and give it to your child or their friends? Of course not. So why eat foods from farms sprayed with insecticide? Pesticides, herbicides and fungicides accumulate in our bodies' fatty tissue, nervous system and other cells. Our body can probably handle a pesticide once in a while, but over time, continuous intake of these poisonous chemicals build up in our bodies and lead to disease, and children are the most susceptible of all to these poisons. You may think it's necessary to use pesticides to keep bugs from eating plants, but that's not quite true. For healthy soil makes plants resilient to bug infestations. Farms that use synthetic chemical pesticides and fertilizers don't have healthy soils, indicated by a lack of live worms and other bio-activity,2 (as opposed to organic farming, which does). The information on the harmful effects of synthetic chemical pesticides and herbicides is staggering. Unfortunately, it is not broadcast in the media and never reaches most people. So it's up to each of us to learn about it on our own. In 1962 Rachel Carson wrote a book entitled Silent Spring, about chemicals in our environment and on our food. The public outcry that followed forced the banning of the very lethal pesticide DDT8 and caused revolutionary changes in the laws affecting our land, water and air. Dioxin causes cancer, birth defects, miscarriages and death in lab animals at even 1 part per trillion and will kill an animal almost immediately. Environmental Protection Agency's Dr. Dianne Courtney called dioxin, "by far the most toxic chemical known to mankind. "11 Yet dioxin is legal. "Ten Years After Alar [a pesticide for apples featured on "60 Minutes" that ultimately led to it being banned], apples still need a cleanup. An apple a day exposes your child to more than 30 pesticides over a year. [That's] an average of four [pesticides] per apple, with six or eight not uncommon. In 1996, the most recent year for which USDA has tested apple samples, government labs detected a total of 39 different pesticide residues on 530 samples. Ninety-eight percent (98%) of the apple samples tested were positive for pesticide residues. Pesticidescan damage the human brain and nervous system, disrupt hormones, and cause cancer. Organophosphate pesticides inhibit the enzyme acettlcholinesterase, a key molecule required to permit the regeneration of acetylcholine at neuromuscular junctions and thereby control nerve to muscle transmission. Many organophosphorus compounds damage nerves directly and these conditions are largely irreversible. Animal studies show organophosphorus compounds damage the central nervous system. Neurological poisoning may take months or years to show up. Concentrated organophosphorus compounds are used to produce nerve gas, and a few drops will kill in a very short time.14 Some poisoning symptoms include stomach and intestinal cramps, vomiting, diarrhea and pinpoint pupils. These pesticides change chemically as they age, becoming even more toxic. "In California's onion fields, farm workers, including children, are exposed to Methyl Parathion, a potent nerve toxin. Among Florida's strawberry fields they encounter Captan, a probable human carcinogen. In Midwestern cucumber patches they face Endosulfan, a chemical that may cause a host of health problems because of its similarity to human hormones. An unreleased US Department of Labor survey shows that 123,000 children [between] the ages of 14 and 17 work in America's fields. Studies show that farmers who are exposed to pesticides and herbicides tend to have elevated risks of leukemia, lymphoma, and other cancers. According to a 1997 study by the International Labor Organization, up to 14 percent of all occupational injuries in the agricultural sector and 10 percent of all fatal injuries can be attributed to pesticides. About half of the illnesses reported in the state of California are associated with agricultural work. 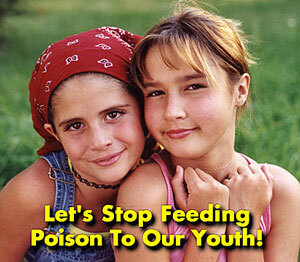 And approximately 1,000 cases of agricultural pesticide poisonings are reported in the state annually. Analysts believe this figure is low, estimating that up to 80 percent of all incidents may go unreported. Studies also show that chemicals used in pesticides interfere with hormones, disrupting the normal growth and development of mammals, birds, reptiles, amphibians and humans. Disturbing evidence includes reduced sperm counts in humans, nervous system and immune system disorders in wildlife and humans; increased birth defects and impaired sexual development in animals. Research shows there is a link between pesticides and herbicides, and most all diseases and cancers.26 Why then, is the information not broadcast by the media, the government or even universities? The answer, of course, has to do with money. There are eight major players in the pesticide industry: Dow, Du Pont, Monsanto, Imperial Chemical Industries, Novartis, Rhone Poulenc, Bayer, Hoechst. These companies produce toxic pesticides, along with pharmaceuticals, genetic food seed and industrial chemicals.27 These companies fund political campaigns, universities and heavy advertisement in the media. These large corporations also have a major influence on the media by funding newspaper and magazine articles, radio shows and television programs via advertisement. The media may report on alternative solutions, but it always goes to experts who have been funded by the chemical giants and who ultimately dismiss alternative solutions. And that is why you will never hear about the poison on your plate. If you want your children, and yourself, to avoid toxic and persistent pesticides and herbicides, eat organically grown foods. Organic foods are grown without toxic and persistent chemicals. You can find organic foods at natural food stores and stores that carry natural products. Our children's mental and physical health, and yours too, is worth the little extra money you must spend to eat higher quality organic food. 2 Lecture in Washington State on Bainbridge Island 1998 by Howard Lyman, former rancher/farmer, and author of "Mad Cowboy." Mr. Lyman used to use synthetic pesticides on his farm/ranch and discovered later how poisonous they were, how the worms vanished from his soil and how the soil died. Now he devotes his time to exposing this information to the public this and other health concerns that pertain to diet. 8 DDT has been found in virtually every living animal on this planet, from East to West and from North to South. It takes dozens or hundreds of years to break down. It has been attributed to human cancer & death of wildlife. 10 Animal products accumulate these toxins in their fat, and so the concentrated amounts are passed on to those who eat meat. 13 Environmental Working Group, http://foodnews.org/nytimes.html; This group does an excellent job of citing their sources of information. 16 Diet For A New America, by John Robbins, pg. 318. 17 Diet For A New America, - John Robbins, pgs 308-349. 19 Medical doctors, university scholars, environmentalists, etc. 22 Think about this concept for a moment­wearing rubber gloves because of the pesticides. Does this food sound safe to you?! 24 Entire paragraph: "Why Eat Organic," http://www.saveorganic.org/whyeatorganic/healthandfoodsafety.html; Pest Management at the Crossroads, Benbrook, Consumers Union 1996; Cancer among farmers: A review, Scand J. Work Environ Health 1985; Our Stolen Future, Theo Colburn. 26 However, there are links to many other chemicals as well. And of course, pesticides and herbicide exposure is not the only reason we get disease.